Before I go on, I think it is important to mention that the truth that Jesus was referring to wasn't a set of principles or laws to be followed. He was speaking about truth being 'reality'. So in essence, He was saying that freedom can only be found through an encounter with the reality of who Jesus really was. In this context, the definition of truth isn't the opposite of falsehood. Truth is a person, and that person is Jesus (John 14:6). The folks who heard Jesus say these words obviously missed the point that He was making because they went on to argue that their true Father was God based on their Jewish heritage. It must have been a very hard word for them to swallow when Jesus responded by pointing out who their true father really was! (John 8:37-44). Yikes! If we are not careful, just like the religious leaders of Jesus' day, we might miss the point that Jesus was making too. If we think the 'truth' that will set us free comprises of keeping to a bunch of 'do's and don'ts', then our focus will be in the wrong place. My point is simply this. The key to the freedom that truth brings us into is our union with Jesus (Galatians 5:1). The key to our growing in sonship is found in our union with Jesus (Galatians 4:6-7). The key to us being free from sin is in our union with Jesus (2 Corinthians 5:21). The key to living in our Father's embrace is in the union that every believer has in Christ (John 17:23). And that Christ-union is the reason why the Holy Spirit bears witness with our spirit telling us that we belong to God and are His heirs (Romans 8:15-17). It is not slaves that belong to the family, but sons and daughters. Sons and daughters who know that they could never work hard enough to earn their place in their Father's family. The truth (reality) is, sons and daughters are simply born into the Kingdom (John 3:3) and everything they receive is a free gift imparted through inheritance (Ephesians 1:13-14). And by virtue of their new birth, they carry within their spiritual DNA, their Father's seed (1 John 3:9). It is this belonging to God through being born of Him (John 1:12-13) that qualifies us to make our home in His heart (John 14:1-3). If we don't grasp that our union with Jesus is the only reason for our belonging, we will tirelessly look for other reasons to justify our place in our Father's house. It is absurd to think that a son would try and find some other justification for belonging, but unfortunately we see it quite a bit in church life. Often our misguided longing to be accepted by God and by others, takes us down a road of endless striving and religious activity. If you can relate to this never-ending merry-go-round of self-effort, perhaps it's time to stop the ride and simply accept the truth (reality) about the gospel? God doesn't love you because you earn or deserve His love. He loves you because He loves you, because He loves you. 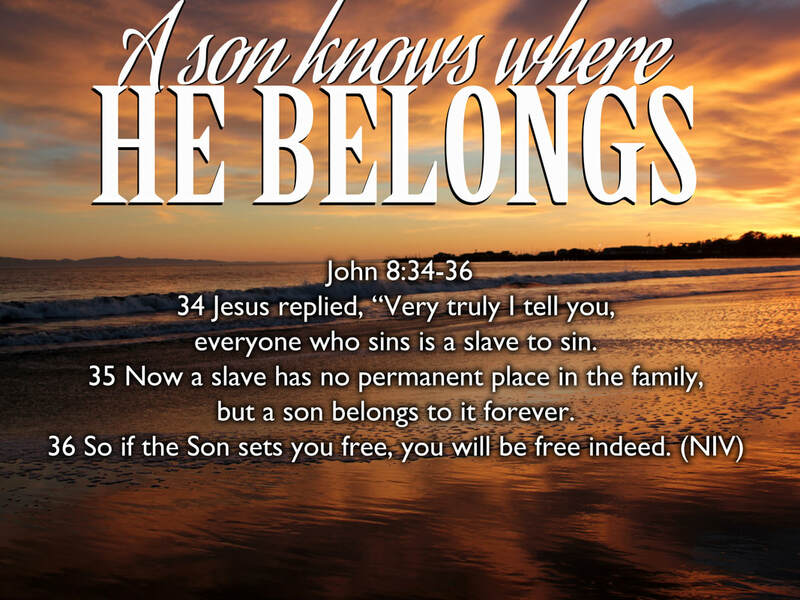 Jesus secured your salvation once and for all and your unique place in His Father's heart ... forever! No amount of jumping through religious hoops could ever get us what Jesus paid for freely on our behalf. The truth (reality) is that we are not slaves working for approval, but real sons and daughters of the Most High. Every son or daughter who knows where they belong, can live a life free from all of the distractions of self-effort so that they can simply take their place at Father's table and enjoy the feast. Whether we are leaping tall buildings at a single bound (aka: the greater works of Jesus), or having an afternoon nap (aka: the Sabbath rest), it's all the same because the basis of our belonging is not conditional on our performance. Now when I say that, I don't mean that sons and daughters don't work and serve in the Kingdom. On the contrary, I am convinced that the most productive believers on the planet are those who know who they belong to. It is secure sons and daughters that will be a manifestation of their Papa here on earth (Ephesians 5:1-2). And it is secure sons and daughters that will manifest the glorious freedom that all creation is longing to experience (Romans 8:19-21). The truth (reality) that will set us free is that we belong in the family of God whether we are at work or at play. The truth (reality) that will set us free is that we have been given the free gift of grace that our Big Brother secured on our behalf (Ephesians 2:8-9). I believe the more we become convinced of this truth (reality), the freer we will be to simply be ourselves so that we can accomplish the good works that our Papa prepared for us to do (Ephesians 2:10). The truth (reality) is that everything that belongs to our Heavenly Father belongs to Jesus and everything that belongs to Jesus belongs to us because we are united with Him! We don't have to strive or work for our inheritance because we are co-heirs with Jesus and His vast inheritance by virtue of our new birth into the biggest, best family in the universe. My prayer today is that we would all know beyond a shadow of a doubt that we truly belong to the family of God in the same way that Jesus belongs. May every shred of doubt, fear, striving, intimidation, performance, legalism, shame and self-hatred be consumed today by a fresh outpouring of our Papa's love that tells us that we belong to Him.